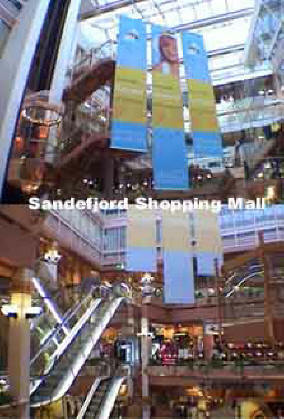 Marcia drove the short 75 miles south and east to the seaport of Sandefjord in an hour and a half. 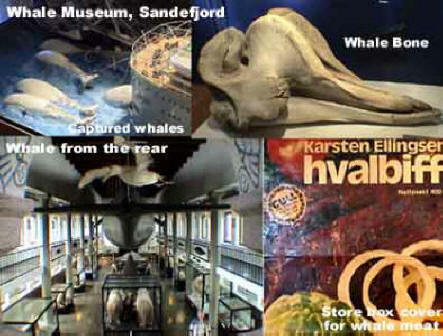 It got its name from the fact it was built on sand (sand = sand in Norwegian). 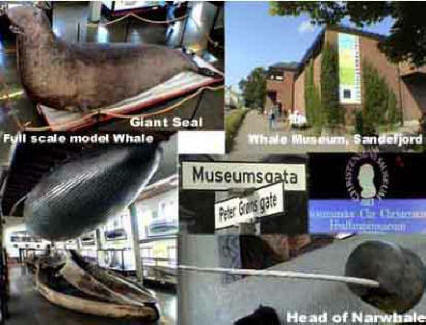 Sandefjord used to be a large whaling center until it was halted in 1968. The city burned totally to the ground in 1800 and had to be rebuilt. It is near here in Gokstadhaugen where the Viking ship Gokstad was unearthed in 1880. We didn’t have a reservation for any place so we drove around but I didn’t see anything that looked like a hotel. 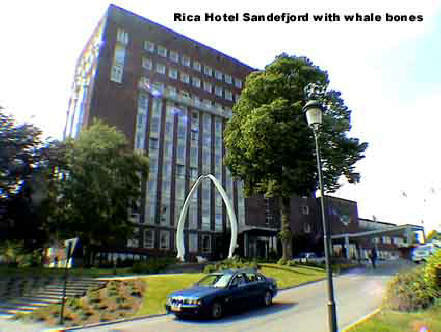 Finally asked in a gas station and they pointed out the large brick building by the shore was the Rica Hotel [Strandpromenaden 9, +47-33-44-7400.] At 8:30 we drove up and I asked how much for a room. The girl asked me how I wanted to pay; cash or VISA. I asked the difference, figuring cash would be cheaper but she told me it was 1500 Kr ($215) if I paid cash and 795 Kr ($114) if I used VISA. She asked again which I preferred and I said I would be an idiot if I didn’t use my card. The room was very nice with a beautiful view of the harbor and city. At 9 PM, I finally reached Wayne Callahan by phone and we had a chance to catch up on ThinOptX. Before it got too late we asked about restaurants and were recommended to check out the one by the port called Kokeriet [, +47-3-346-6262.] 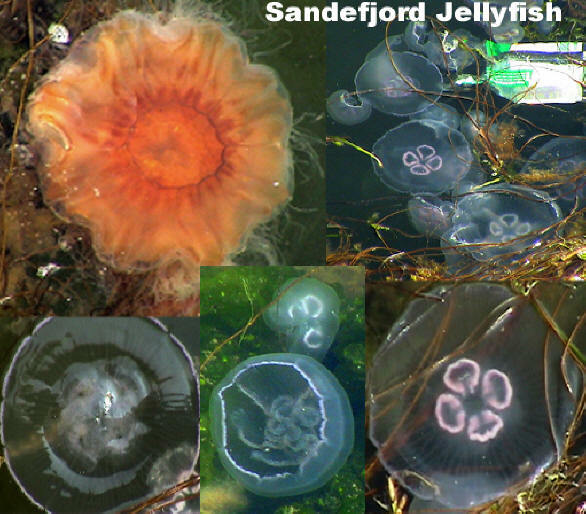 We walked down by the shore and in the evening light, Marcia spotted the jellyfish in the water. I hadn’t seen them but when I looked there were thousands of them swimming around. Many of them were very beautiful. 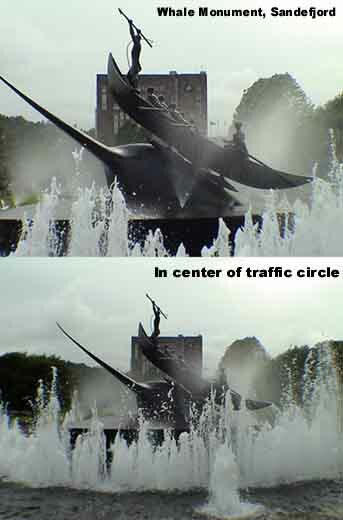 We walked past the Whaling monument in the center of the traffic circle (above left) and found the Kokeriet. They gave us a nice table in this quaint little place. I ordered a Ringnes (the local beer) and then we ordered a bottle of Italian wine. Marcia had fish soup again and I was shocked to find whale meat on the menu. 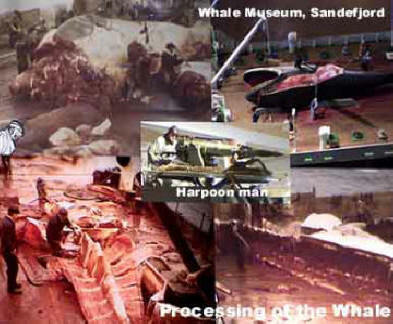 I didn’t believe anyone but the Japanese ate whale meat. 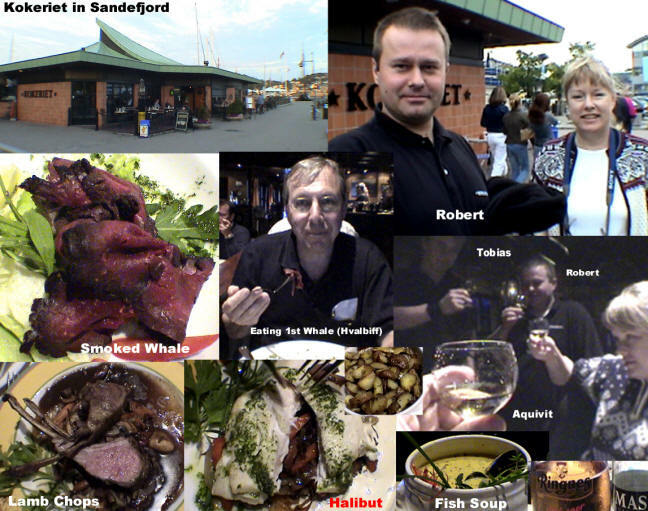 I had to try it so Tobias (a Swede, below right) recommended that I have the smoked whale appetizer for my first time. It was very tasty so next time I will try a whale steak. Marcia had halibut and I had lamb chops. She finished with strawberries and ice cream. After the place emptied out, Robert (the manager) joined Tobias to chat with us for about an hour. They plied us with free aquavit which tasted like grappa and gave us a lot of advice about our future travels in Scandinavia. They were very nice. At 11:30 we walked back to the hotel and went to the bar which was very lively. I had a beer and worked on photos and got to bed at an early 1 AM. I woke up at 5:30 AM and again at 12:15 with the cold finally abating. We checked out of the hotel (using VISA) at 2 PM and Marcia wanted to have lunch so she had a hamburger out on the patio. I felt it was too cold so I had a coffee and worked on photos inside. 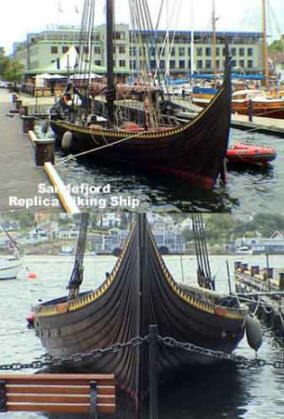 We left there and went back to the wharf to see the last working whaling vessel, the “Southern Actor” (above center) and next to it was a rendition of a Viking ship in the water (above right.) 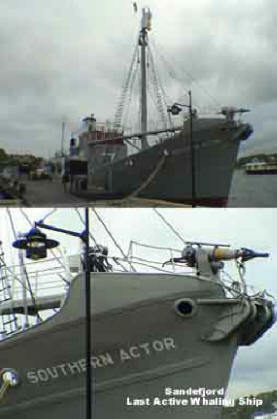 It was now 5:30 and time to head southeast to the southern tip of Norway and Kristiansand.